This mysterious word was as much a part of my grandparents' house as the furniture. It took me a long time before I was able to fully appreciate my grandparent's game. Skepticism kept me from believing in true love – one that is pure and enduring. However, I never doubted my grandparents' relationship. They had love down pat. It was more than their flirtatious little games; it was a way of life. But there was a dark cloud in my grandparents' life: My grandmother had breast cancer. The disease had first appeared 10 years earlier. As always, Grandpa was with her every step of the way. He comforted her in their yellow room, painted that color so she could always be surrounded by sunshine, even when she was too sick to go outside. Now the cancer was once again attacking her body. With the help of a cane and my grandfather's steady hand, they still went to church every Sunday morning. But my grandmother grew steadily weaker until, finally, she could not leave the house anymore. For a while, Grandpa would go to church alone, praying to God to watch over his wife. Then one day, what we all dreaded finally happened. Grandma was gone. 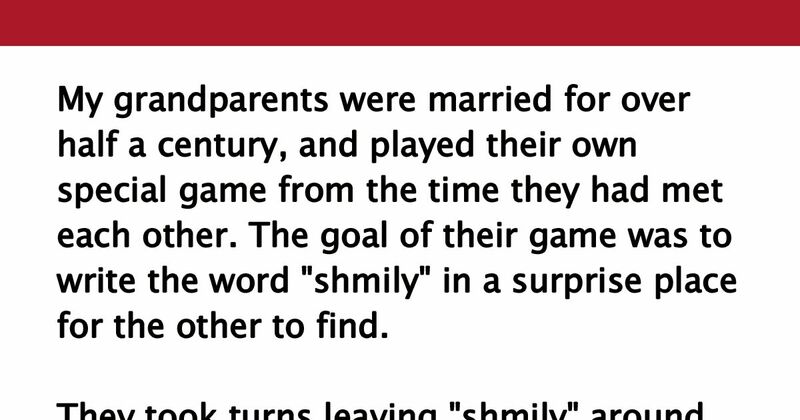 "Shmily." It was scrawled in yellow on the pink ribbons of my grandmother's funeral bouquet. As the crowd thinned and the last mourners turned to leave, my aunts, uncles, cousins, and other family members came forward and gathered around Grandma one last time. Grandpa stepped up to my grandmother's casket and, taking a shaky breath, he began to sing to her. Through his tears and grief, the song came, a deep and throaty lullaby. Shaking with my own sorrow, I will never forget that moment. For I knew then that, although I couldn't begin to fathom the depth of their love, I had been privileged to witness its unmatched beauty. "S-H-M-I-L-Y: See How Much I Love You." So sweet. SHARE if you shed a tear to this story.